Turkey Grand Slam Heads-Up Champion! Thanksgiving is here and that means a few things: Turkey, Football and Poker… also family, but I think I covered the most important three first. As you get ready for turkey day, spend some time honing your heads up poker skills to get ready for the Turkey Grand Slam at CarbonPoker. How do I get in? Good question! Just hit up any of CarbonPoker’s specially designed Turkey Jackpot SnGs to earn Thanksgiving Leaderboard points. At the end of November, the Top 128 players on the Leaderboard will duke it out in a heads up tournament. The Grand Slam Final works exactly the same as Wimbledon, where qualifiers will be pitted against each other in Heads-up battle and play down until we have just one Champion! Half of each Turkey Jackpot SnG will be added to the Thanksgiving Jackpot – which already starts at $2,500. The more games that go off, the bigger the final prizes will be. And the more that you play, the better unique starting stack you’ll have going into the final tourney! 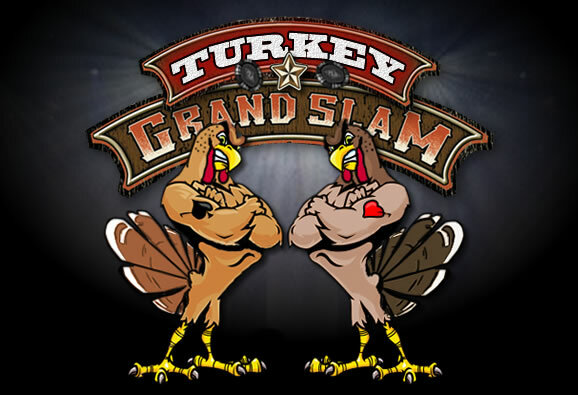 The Turkey Grand Slam Jackpot will be seeded with $2,500 plus half of the fee from every $2, $5, $10, $25 and $50 HU Turkey Grand Slam Sit & Go played between November 1 – 30, 2009, inclusive. The Jackpot prize winner will be the player who places first in the Jackpot Grand Slam SnG Final on Saturday 5 December, 2009, 14:00 (Carbon Time). The leaderboard being displayed is to be used as a guide only and the statistics from our game server logs will be used to determine final standings if there is any discrepancy between the leaderboard and the actual raw statistics. Any form of cheating or collusion will not be tolerated. Please stay within the spirit of this promotion and do not play a friend over and over again. We will be checking all game histories and if it looks like something fishy is going on against the spirit of the competition you will become ineligible for the prize and may have your account closed. Qualified players who miss registering for the Turkey Grand Slam SnG Final will forfeit entry and not be compensated for such. We recommend not eating too much turkey on Thanksgiving or you don’t fall asleep at the table. Any Breach of the Terms will result in instant removal from the Promotion. Poker Tip: Before signing up to a new poker site, always check PNB rakeback offers to see if you can get rakeback. This entry was posted on Sunday, November 15th, 2009 at 1:13 pm and is filed under Poker News. You can follow any responses to this entry through the RSS 2.0 feed. You can leave a response, or trackback from your own site.